We have a b’day coming up in the family next week. Kids and I decided on stepping stones all around. This is why I love kids: ask them to create something and it’s done in less than a day… They’re so clever! Kids don’t dwell on the how, the perfection, the I-can’t. They just do it: brainstorm on what, choose colours, draw it out and start breaking tile and nipping, setting tile, grouting… Ta da! Laura Harris of Melonhead Gallery, was first “introduced” to me by Carol Shelkin. An email from Carol, read, click and… POW! I was literally blown away. That hasn’t happened to me, to that extent, in a long time. Her work is magnificent. To be perfectly honest I grapple for the words that describe how I feel when I view her work, and that is all in a photo on my trusty ol’ computer, so I can’t imagine what it would be like in person. She is in my mind a Mythmaker, to borrow a term from the righteous James Hubbell. Born in Wisconsin she is the daughter of late Midwest sculptor/painter, Walter Lenz. Laura has been working in mixed media, including fiber art, acrylic art and mosaic art for over 25 years. 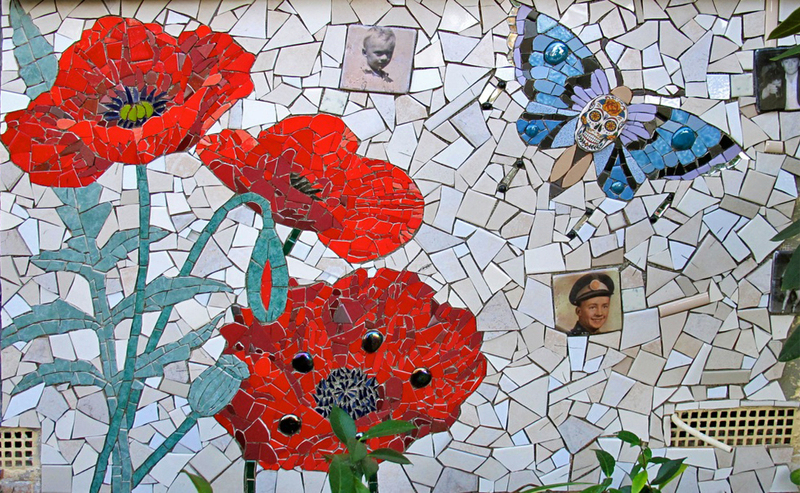 More recently, Laura has concentrated on mosaic portrait art. 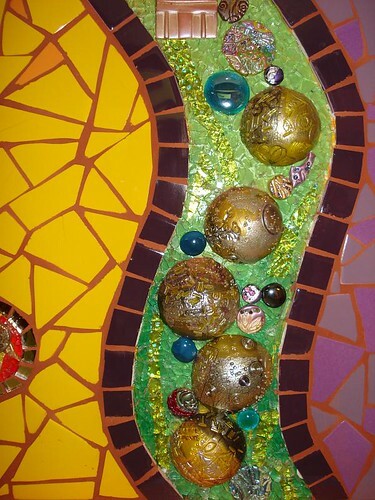 Using a preferred direct method of application, her choice in tesserae include venetian and dichroic glass, 24 Kt. Italian gold smalti, porcelain, ceramic tile, mirror, stone and salvaged or recycled materials. Laura’s career was not always limited to the field of art. She worked as a speech-language pathologist for over 15 years and was recognized in 1998 as one of the top 5 teachers in Wisconsin for her efforts in the field of Assistive Technology and voted New Berlin Public School Teacher of the Year in 2001. The lovely Laura in the Cave of the Mounds on a family holiday, before exhibiting in Madison’s Art on the Square. Classes are currently restricted in size to a maximum of 4 students, minimum is 2. 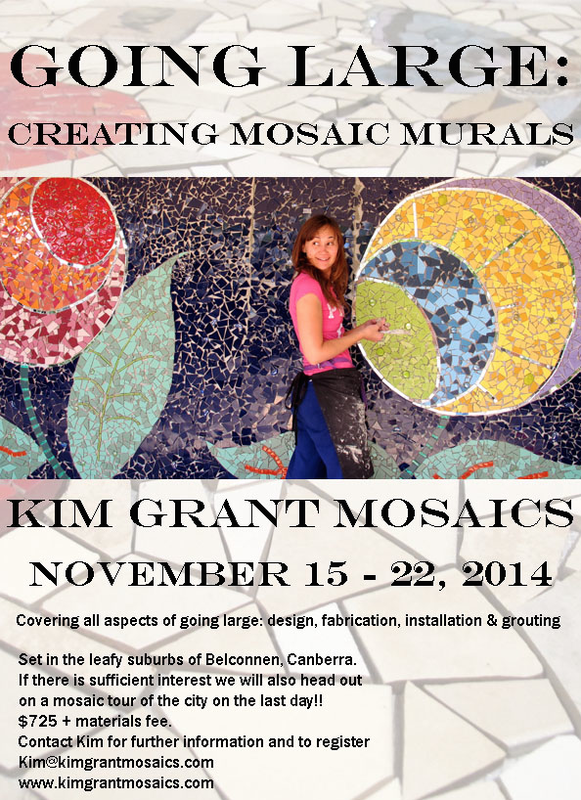 Perfect for beginners who have had no mosaic experience and are also adaptable for those seeking more of a challenge. I’m also offering one on one tuition and can travel, given the right circumstances 🙂 Please just contact me if you’re interested. Artist in Residence at IMA!! 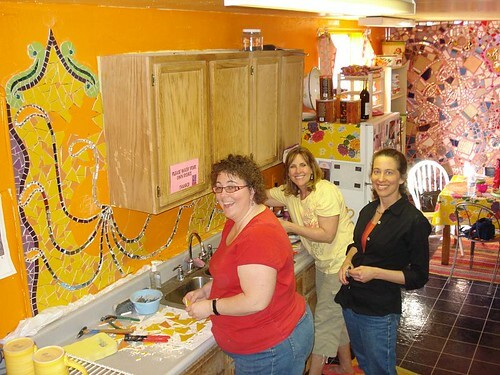 Laurel True was kind enough to let me do a stint at Artist in Residence at the Institute of Mosaic Art (IMA). 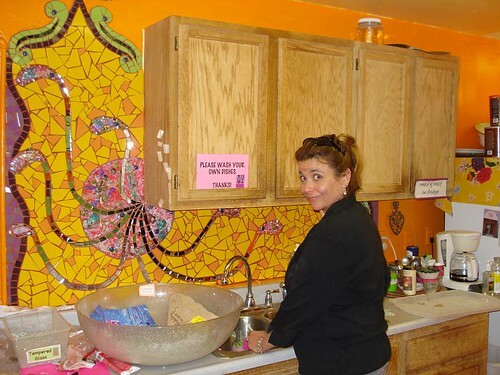 When I inquired about perhaps helping out with something at IMA, I wasn’t expecting an ‘Artist in Residence’ tag at all, but was more than happy with it 🙂 Laurel had mentioned the kitchen backsplash which piqued my interest, amongst many other possibilities. I was worried that time pressures and other personal pressures may prevent me from finishing it, so I left myself open to anything. I had mentioned it to Susan Crocenzi – looking to collaborate with her cuz I thought it would just be fun! 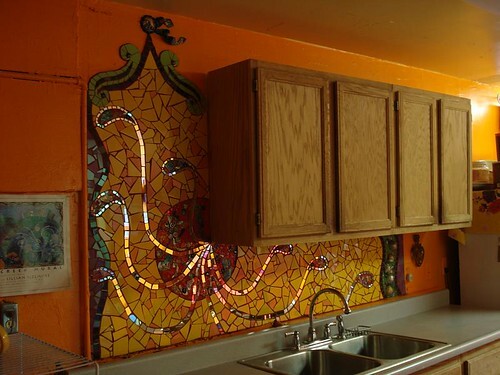 When I arrived and went over, I thought to myself the backsplash would be the perfect thing to do. Yet again proof of working well under pressure 😉 With no design ideas in mind and no inkling, at that time, that I would be surrounded by fellow artists a la Linda Martin, Kelley Knickerbocker and Rachel Rodi [who are waaaay awesome!!! ;)] to help finish the installation I set about doing the kitchen backsplash direct (knowing that I had 4, maybe 5 days to get it all done)! – simply because I had no design in mind and worked it as I went. I knew that if I sat down and drew stuff out, it would not get finished. Susan came in on the last day (all the way from Nevada City!) and added her tempered glass and polymer clay accents, all of which I think make the installation! Some of the polymer clay pieces she had made many moons ago and they just fit with the theme – colours, shapes… it was just perfect! Like it was meant to be somethin’… We finished just in the knick o’ time. Last day of installation and the name for the piece hadn’t even cropped up… Susan and I decided to call it Reach. 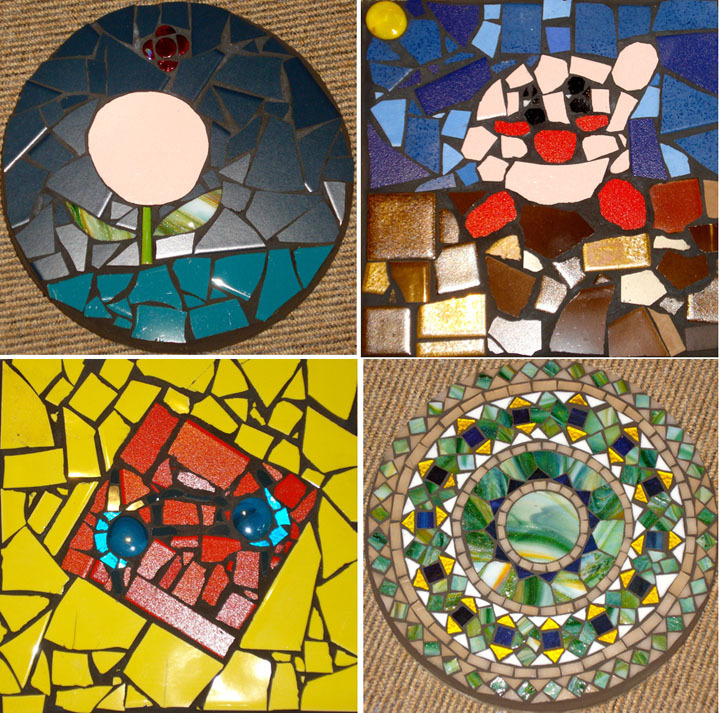 Have I mentioned how FUN it is working with fellow mosaic artists?!!! Spreadin’ the love is good in numbers! Suzanne left the city behind and now lives with Aiken and their two dogs on 100 acres north of Toronto. She has two beautiful grown children, a son Stefan and daughter Sasha and a wonderful stepson, Taylor.